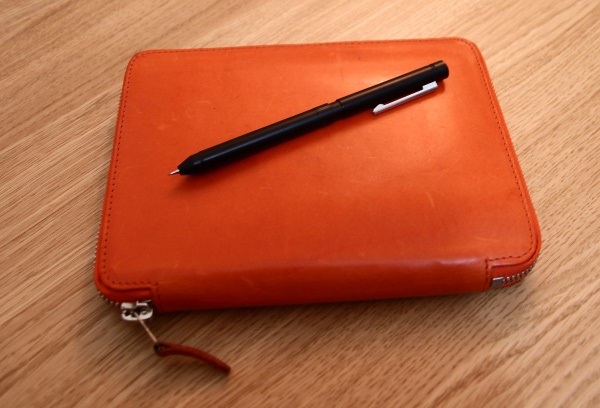 Shortly after writing about my Analogue Note Taking System I misplaced my favourite pen and it really bothered me. True, it was only for around 36 hours, but it was long enough to get me thinking. Writing in my journal and my notebooks is very important to me, and I need to have a backup pen I can be happy to use at any time. It has to be more than ‘just okay’ and actually give me joy to use. It has also been a quest of mine to find a truly decent multi-pen, so I set out to try and solve both issues; a multipen which could act as a backup for my favourite pens and pencils – while still being as enjoyable to use as possible. I had tried a couple of multipens fairly recently (Jetstream Prime, Style Fit Miester) but both had flaws I couldn’t get past for everyday use. Both of them ended up being very useful spare pens which I would keep in my bags, but using them wasn’t as nice as I wanted. Then I found the Zebra Sharbo X LT3. I had known about the Zebra Sharbo multipen system for a while – I knew they were more premium than many of the others, and I knew that they used the standard D1 refills. I took another look at them and found the Zebra Sharbo X LT3 on JetPens. While it isn’t the most expensive or impressive Sharbo X multipen, it’s a really great offering. 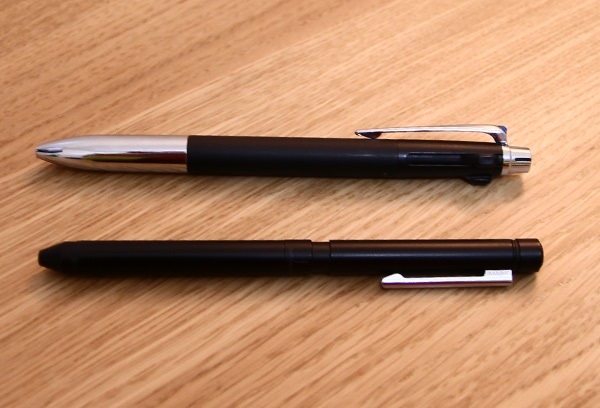 It’s pretty thin for a multipen too, as you can see below in comparison with the Jetstream Prime. Like the Jetstream Prime it is made of high end materials, but the biggest and most important difference is how it feels so much better. It doesn’t rattle. For me the fact that the Sharbo X system uses D1 refills was one of the best selling points. There are plenty of options from multiple manufactures – allowing you to mix and match with refils from Zebra, Uni, Lamy, and more. My favourite online pen stores like JetPens and CultPens have lots to choose from too. The Jetstream refill is the most obvious choice for me. This is the type of ink I use the most, and as this was directly aimed as a substitute or my existing black 0.7 mm Jetstream – it had to be included. The amount of ink included in these D1 refills is significantly less than I am used to, which makes me worry that it will be too expensive to use. However I am still on the original refill I put into this pen when I first got it – 60 days ago at time of publishing – and I have been using it every day to write in my Hobonichi and my Field Notes. As I use the Jetstream ink this more than anything else, I would expect it to be the first to need replacing. Of course, I have thought ahead and got myself some spares from CultPens. This is a very interesting experiment. My first thought was to use another Jetstream refil with red ink (in a similar way to my Myster) but I decided to try something a little different. I went for a LAMY M55 tripen marker refill from CultPens. It has proven to be really great in a number of use cases – from highlighting parts of printouts to shading in doodles. As the colour is quite light you can layer it really well, allowing for some very creative use. Though I have found that it is sometimes it’s a little dirty on first use. This is probably to do with the way it is stored inside the barrel, and not a deal breaker. It’s not a liquid ink like a normal highlighter, so it can’t be used in the same way as other highlighters, but I’m rather impressed and glad I took a chance on it. First of all, I have to get this out of the way. This pencil is never going to be as good as my Kuru Toga. How can it be? I have been spoiled by what is – in my opinion – the very best type of mechanical pencil by using various designs of the Kuru Toga for many years. That aside – the barrel itself has to take a pencil in the third position, so I am more than happy to take advantage of it. Having a pencil is always useful and I often use it with my Field Notes for drawings, sketches, and other types of notes. You have to buy the pencil lead housing separately, with choices of 0.3, 0.5 and 0.7 mm sized leads. I opted for the 0.5 mm and filled it with B grade Nano Dai lead from Uni. It has been a favourite of mine and I used it in my Kuru Toga pencils before the specially designed Kuru Toga lead became available. Investing in a Sharbo X & refills isn’t cheap, but that’s ok because it feels expensive.